In the morning of October 21, 1996, Death Valley National Park (DVNP) Ranger Dave Brenner was aboard a military helicopter somewhere in the skies over the southerly part of Death Valley. He was part of a routine aerial surveillance looking for clandestine drug manufacturing labs in the backcountry. Around 11 AM, he saw something unexpected: A vehicle in the wash of Anvil Canyon, approximately 2.4 miles downstream from Willow Spring, the head of Anvil Canyon. This was extremely odd for several reasons. First, there wasn’t a real or legal road down Anvil Canyon any longer. At one time Anvil Canyon had been the only route into Butte Valley, and used by the area’s miners. But with the opening of the talc mines in Warm Spring Canyon to the north, and the creation of a good, well graded dirt road to the talc mines for heavy trucks, the Butte Valley miners pushed an extension of the Warm Spring Road westward into Butte Valley and the Anvil Canyon route relegated to a seldom-used byway. Then, in October of 1994, with the passage of the Desert Protection Act, Anvil Canyon was designated as part of an official wilderness area, thus prohibiting vehicle use in it. Not that the few locals seemed to adhere to the prohibition, as Anvil Canyon still received occasional, if illicit, use. 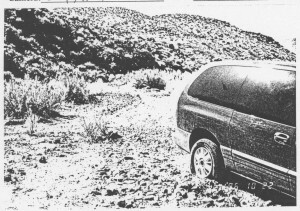 The second piece of oddness in what Brenner was observing was that the vehicle appeared to be a standard passenger van. 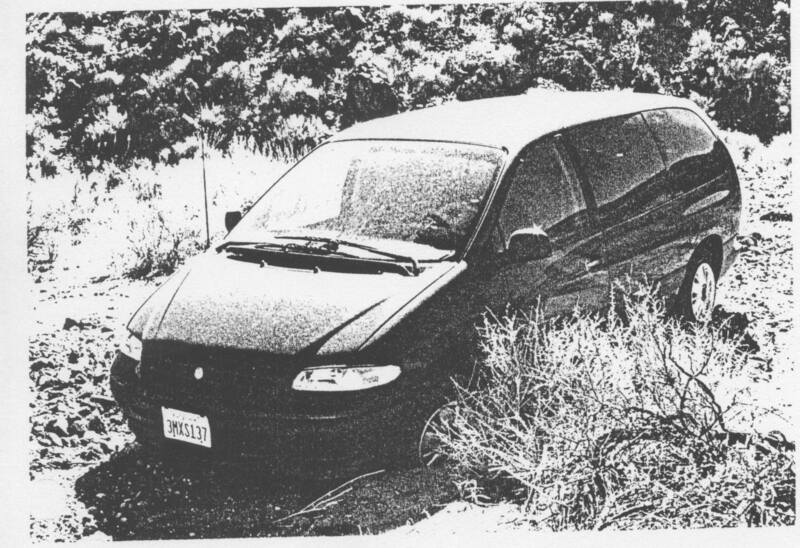 While Anvil Canyon could still be travelled by a competent four wheel drive vehicle (if illegally), a passenger van was totally inappropriate and couldn’t be expected to get far in that canyon. Yet there it was. Upon landing nearby, Brenner inspected the vehicle. It was a green, 1996 Plymouth Voyager van with California license plates. It was covered with considerable dust, as if it had been out there for some time. The van was clearly stuck in the wash, sunk up to its axles in the sand, with its two rear tires flattened and its left front tire also flat. 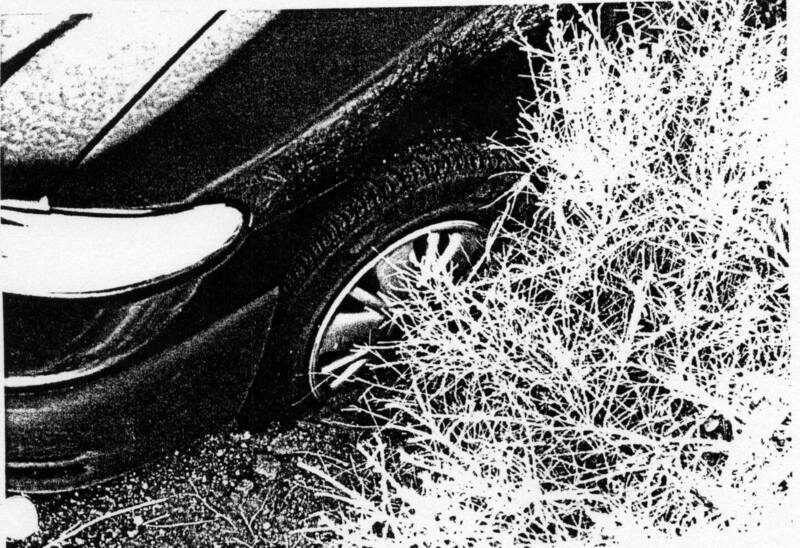 Tracks left in the sand by the van suggested it had been driven at least 200’ with flat rear tires. The van was locked, with no sign of the owner. Brenner noted the license number and reported it back to the DVNP headquarters. A quick check on the license plate with the California Highway Patrol (CHP) revealed the vehicle was reported stolen by the Los Angeles Police Department on September 10, 1996. The vehicle, owned by Dollar Rent a Car, had been rented to a group of four German tourists in Los Angeles on July 8, 1996. The vehicle had been due back to the rental agency in Los Angeles on July 26, but had never been returned. It was the rental agency’s policy to wait at least 30 days past when a vehicle was due to report it stolen. Checking the names of the renters turned up an August 14th INTERPOL alert on them. They were Egbert Rimkus, 34, his son Georg Weber, 11, Egbert’s girlfriend Cornelia Meyer, 28, and her son Max Meyer, 4. Further investigation showed the group left Frankfurt and arrived in the United States at Seattle on July 8, then immediately flew to Los Angeles where they picked up their rental van. Because Egbert could not produce his driver’s license, Cornelia was recorded as the driver. The van was due back on July 26th and the group had tickets on TWA to return to Germany on July 27th. They were not on that flight, nor was there evidence of them leaving the USA. For the first week or so in the USA, the Germans based themselves in the San Clemente area of Southern California, doing normal tourist things. On July 12th, Egbert made a call to his bank in Dresden requesting $1,500 be wired to a Bank of America branch in San Clemente (the money ended up being sent to a Bank of America branch in Los Angeles). At this point their travels become a bit vague, but the images on their recovered camera suggest they traveled the California coast a bit, before ending up in Las Vegas and staying at the Treasure Island Hotel. On July 21st, Egbert faxed a request from the hotel to his ex-wife and son’s mother, Hieki Weber, requesting additional funds be sent to him. These funds were never sent. The party checked out of the Treasure Island hotel on July 22nd, and proceeded to Death Valley. Receipt records at the Furnace Creek Visitor Center show that on July 22nd, two copies of the booklet, “Death Valley National Monument Museum Text” in the German language were sold. None were sold on July 23rd. A copy of this booklet was found in the abandoned van, which places the group at the DV Visitor Center sometime on July 22nd. Meanwhile, back at the van in Anvil Canyon, an investigation and search was beginning in earnest.